Recently, we reported that Martin Sauter of Shin'en Multimedia — the studio responsible for the Nano Assault and Jett Rocket series — had made very positive comments regarding the Wii U. We only know you need to treat the Wii U differently then those consoles because of a very different and in our view more accessible architecture. There is a lot power to unleash in the Wii U. Enough power for many years to come, at least from our point of view. We know many people see us as Wii U experts. That is because we got a lot of technical praise for Nano Assault Neo but it’s not well deserved. 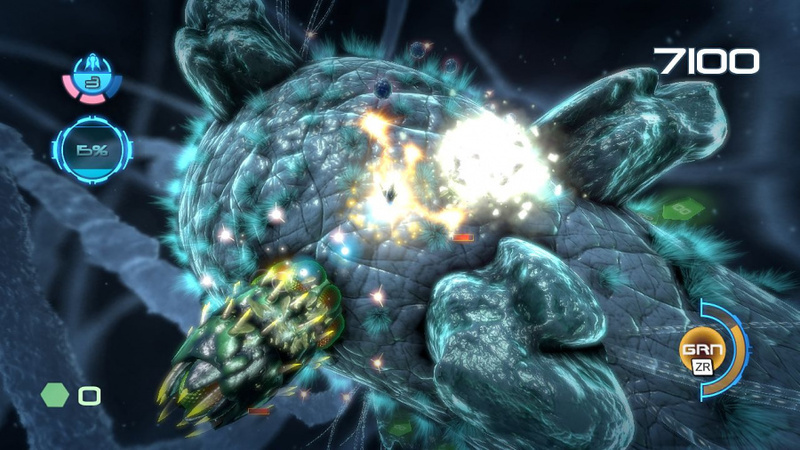 Only very tiny bits of Nano Assault Neo took advantage of the Wii U architecture. We had the game from start in 720p at 60fps. We drew the complete game world twice for TV and GamePad. We had tons of overlays, special effects and even camera streaming and still had no GPU or CPU problems. So we simply had no reason to dig deep into the architecture. We didn’t expected to be seen as the spearhead of Wii U graphics as it undeserved, when looking at what the Wii U can truly achieve. The Wii U GPU is several generations ahead of the current gen. It allows many things that were not possible on consoles before. If you develop for Wii U you have to take advantage of these possibilities, otherwise your performance is of course limited. Also your engine layout needs to be different. You need to take advantage of the large shared memory of the Wii U, the huge and very fast EDRAM section and the big CPU caches in the cores. Especially the workings of the CPU caches are very important to master. Otherwise you can lose a magnitude of power for cache relevant parts of your code. In the end the Wii U specs fit perfectly together and make a very efficient console when used right. It's always nice to hear developers speak so glowingly about Nintendo hardware — do Linzner's comments fill you with a bit more confidence for the Wii U's future? Or are you already positive regarding the system's long-term chances? Post a comment to tell us your thoughts. "Several Generations" Ahead of Current Consoles? Wii-U is neat and all, and I'm no techie, but come on. Good for around 25 years, huh? @Midnight3DS you sure you aren't a techie? Nice job pulling 25 years out of your booty. Obviously several generations was a slight misspeak when he really meant several years. Why do we have to crucify people for using the wrong word on accident when we all know what was meant to be said? It's great that they've become so skilled at the nuances of the Wii U. A small indie company that is taking risks and taking the time to learn the ins and outs of the system. I wish every gaming company was as spartan and intellectually curious as Shin'en is. I see big things coming from a company like this. I'm happy they state what I always believed in: Quality over quantity. Hope they bring "FAST League Racing" to Wii U and 3DS. Boxed physical edition and everything, id buy it. I would also not mind for a "Nanostray" collection,,. How long is a generation generally? What does 'several' imply to you? More than two I hope? Start computin'. Well I sure haven't seen that "power" everyone keeps talking about. BTW when he says "several generations" he means GPU generations not console generations(i.e PS2 to PS3 or SNES to N64). @Midnight3DS You sure you're not overreacting? The numbers themselves show us a GPU that is much, much more powerful than what X360 has onboard. It's 48 SPUs at 500 Mhz on MS console versus 320 SPUs at 550 Mhz on Nintendo machine, and I don't think that those are based on anything older than R700. That alone puts this GPU eons ahead of what Xenos was capable of. Of course there are other factors to that, but my point is - "several" is not completely unreasonable. And WiiU's CPU is an entirely different story altogether. @PokeTune Well that is the problem with every Nintendo console since N64 - those are powerful machines, but few companies take advantage of that or even care, because it is commonly accepted that those are consoles for younger and casual gamers, so you don't have to put effort into your games. I figure we're going to see that power when big first- and second-party titles show up during E3. Cool. How long is a GPU generation, approximately? @Midnight3DS I'll answer your question - on PC it is a year, maybe a year and a half as of now. And with that measure applied Latte IS several generations ahead of current-gens. @Kifa Well hopefully Ninty delivers the goods on the 11th. I need 3D Mario and Smash Bros. in my veins, STAT! At least indie devs can take proper advantage of the hardware. Who knows, maybe some will grow and soon Nintendo will have real third party support again because they were so indie friendly now. Courting indie devs on the chance they grow into AAA studios is a thing that could happen, right? The guy meant years, not generations. We all know that is impossible. A new PS4 isn't powered enough for several generations. Take the overall text of his dialog and don't punish him for one tripped over word. It's a very interesting statement as Linzner didn't just say that WiiU is very powerful, but also pointed out how it's important to use right the WiiU characteristics else you get the complete opposite impression. @PokeTune He. :] The nick has a long story. And I love me some Metroid that can't crawl for an avatar. @Kifa Personally from Retro I'm hoping either for an FPA Metroid,New FPS IP or a western RPG. Any of these would be fine in my books. @BakaKnight Well, naturally you have to use it right or you end up frustrated. Yeah, yeah, we've cleared up my mistake before your lecture. Thanks. Obviously he ment GPU generations which occur every couple of years as opposed to console generations which occur every time manufacturers decide its time to make a new one. @Shworange Xbox 360's Xenos chip was based on ATI's r520 chips. Wii U is based on r700, four generations ahead. Yay for Shinen! Its too bad that the big companies seem to deem "different" architecture to mean "too hard" to work with. From what I've seen Xbone & PS4 seem the exact same to me, or close enough that they do all the same things which is quite sad imo. Nintendo really understand the need to stand out from the crowd but I haven't seen any big innovation that PS4 has that XBone doesn't & vice versa. Go go Shin'en go! @WiiLovePeace Well you gotta remember Shin'en almost exclusively makes games on Nintendo hardware so they already have prior experience while most 3rd parties don't. Don't you just love it how people can jump into other people's head and say what they mean? Because I just love the comments section being like this "Nope he mean GPU generations" and "he mean several years not generations" nonsense. But hey, feel free to exercise your 1st Amendment (USA) or whatever you have. Personally I think the shelf life of any console is over when the consumer stops buying it. You may have 10X as much processing power and 50X memory, but at some point people will get bored of the same old experience and something else will come along with 20X processing power and 100X memory with an in built ironing board that people want more. The only way to have a long life console is to keep producing different games people actually want to play. Perhaps he means several generations as in the generations of GPU architecture which are not related to console generations. The size of transistors in a chip have come down a bit in the last 7 years. What he is saying in laymans terms is If people use the Architecture Properly, Don't rely on the Processor to do everything, use the memory caches and the GPGPU how the design of the hardware is intended and the WiiU will chuck out Next gen looking games and not current gen looking games. He's not saying the WiiU is as powerful as the xbone or ps4, but he is saying that those game engines that won't work on WiiU, according to those developers who dislike the WiiU would work if they altered the game engine to use the Caches available and the GPGPU properly.. in a indirect way. tbh something sensible WiiU owners know anyway, but given several reasons, (non legitimatly about lack of power of the WiiU), including the Ps4/Xbone having pc-like architecture developers would rather cut-n-paste games between platforms than spend time optimizing game engines for WiiU. @H_Hunter Sony/M$ have designed thier next consoles to have a 10 year lifespan, witj a new model released in 7/8 years. In the hope, with measures built into the ps4/xbone to steer consumers that the next consoles can be all digital downloads. WiiU was, for me, obviously designed to have a much shorter lifespan of 5/6 years with a WiiU2, or what ever released 4/5 years down the line. With Nintendo Network, Miiverse, eShop, and the gamepad I've always had the impression that the WiiU is the test-bed platform to see what works, what doesn't and to iron out kinks in thier system/s before investing heavily in a console intended to have a long 10yr lifespan. (Wii's to some extent was the same with the WiiMotes but I think the sheer popularity of the system gave it a extra time pass). Several generations ahead gpu equates to about a 4/5 year lifespan as you say kind of falling in line to my theory/feeling. This is really tecnical, i guess that if AAA devs does not understand what's true about this they simply don't care about nor Nintendo nor the Wii U.
I'm glad Wii U is trying to avoid stupid ports having this architecture, it's really all on devs. Like I said before. Shinen's comments should spread through the internet like wildfire. I just love this guys. The WiiU is so fast and powerful that we have long load times between apps! "Several Generations" ahead of current gen? If you believe this you also believe the PS4/Xbone are a generation ahead of £17,000 high-end PC, which has also just be claimed. All i have to say is BS, on both accounts. We've seen with recent gears offering and halo 4 that high powered graphics can be put on old technology pretty well. 2gigs of dedicated ram is more than enough to push graphics. Multitasking is the new concern and I'm not sure Ninti will require a lot of background noise, I don't see them as a profile tracker or selling your information like the other two. I've done some programming and I wouldn't claim to be an expert, but developers need to either load large portions of the engine to a harddrive or keep their code clean. If they can do that, then there isn't any reason these high powered games couldn't happen on wii u. 8 gigs of dedicated ram is for background noise in my opinion, taking the same approach as apple and monitoring activity. Wii u is not an ads machine. @Einherjar Thats because AAA developers don't want to learn the hardware. They just want to compile their code directly with the compiler provided with the Wii U and be done with it.... Shin en explains that you have to change how you manage memory/cache to really get to the power of the system.. Since Time = Money in AAA publisher world, its a cost they are not ready to sink in it for lackluster software sales.... We will just have to wait and see what these devs can do over time. When he said the GPU is several generations ahead, he was probably not referring to console generations, but GPU generations, which are typically a lot shorter. And with that measure applied Latte IS several generations ahead of current-gens. Latte is the codename of the GPU used in the Wii U, co-designed by AMD and Nintendo i forget who manufactured it now. The Xbone 8GB, 3GB runs three OS and another OS for app's, download etc, and 5GB for games. The PS4 8GB, 1GB for OS 7GB for games. Isn't an amazing when a small developer can come in and school the big guys? I have no problem with the Wii U's graphical output. So what if its just a souped up PS3 - there's nothing wrong with how PS3 games look in my view! Gameplay is much more important than graphics anyway. As long as the games look respectable on a HDTV, and play well, I'm more than happy. I've had a Wii U for 6 months now and it's a great bit of tech but today I've been toying with trading it in for a PS3. The reason? It's nearly 8 months since launch and having beaten Mario U & Zombi U, what else is there for me to play? I've already hammered ME3, Need for Speed, FIFA13 (erm...12) and Batman. So my options are Nintendoland and a load of NES games on eshop. Some indie games are ok, such as Runner 2 but that's also on other consoles. I also walked in to Game on our High St and they said I'd get £13 for Mario U! £13?? What the hell. Their reason.....we have sold 10 Wii U games in the last 2 weeks. HMV Don't do trade ins anymore and Tesco have 2, yes 2 Wii U games on their shelves. Add this to the lack of TVii, the bugs, small storage and drops in frame rate and despite the article above, I'm very disallusioned. I love Mario Kart and Zelda but I'm expecting HD remakes. Playing games off TV is cool but Zombi U, Lego City, don't have this option. At this moment, I can't think of a reason to keep my Wii U and I think I'm going to trade it before the trade in value falls too much. I've always been a Nintendo fan and I've had every console since the NES but I'm not happy with this latest console right now. Few spelling mistakes in there, serves me right for using my phone! Don't forget that the consoles he is comparing the WII U's GPU architecture to are over 7 years old!! I've replaced my PC Graphics card 9 times in the last 7 years. The Wii U Graphics card tech is about 3 to 4 years old. I know that doesn't count for much but if you base your console on older tech, it will struggle in the next 3 to 4 years. Graphics are cool but gameplay is where it's at and at the moment, the Wii U doesn't have the games. How long do we have to wait for exclusives? Ok i think now the word generation(s) just gets thrown around. Sounds like some good stuff on the inside though. @wober2 It does sound good but right now my box is gathering dust. Where are our games? @Einherjar Criterion had no problem, and even Blops 2 was no worse than 360 (for me anyway), but many devs who make ports can be lazy. It wasn't so in the days of SNES V Genesis/Mega Drive, as they were more different yet devs didn't mind putting in the effort to make the ports, even if they had to make every bit of it from scratch. @Monkeyofthefunk I know, hopefully monoliftsoft releases "x" soon. I am excited for that one. I do still play monster hunter and it is a really good game but yeah they need more selection. @MadAdam81 those days were the golden age of gaming but now it's become a more mainstream type of entertainment and it's all about getting the most money for the least amount of work. I recently read that a director of a small games company said that if they had to develope games for the PS3 and Wii as well as the Xbox 360 they would have to charge £60 per game to cover man hours and the hiring of extra staff. Xbox One and PS4 are very similar in basic spec so it's going to be even easier for developers to port their games. Will the Wii U miss out? @Wober2. I agree there have been some great games but not enough and with the lack of entertainment features beyond games, my Wii U is not getting used. @banacheck What part of this don't you understand? He was referring to the GPU, which as I stated above, is four generations ahead. Finally someone with some balls came out and said it. Us Germans don't mess around. I hope for Nintendo's sake this is true, but it's the polar opposite of what every other dev has said. There are reasons why Unreal 4 and Frostbite 3 are not on the Wii U, and financial reasons are are only part of that story. It's also telling that even first party games such as Pikmin look essentially like Wii games with spec maps. I believe the game did begin in the Wii, but there are very many ways to easily make things look current-gen, and very few are on display in Pikmin. Textures are very low res, and there are no parallax, normal, displacement, incandescence, gloss, or AO maps. It doesn't even use FXAA or MLAA, which has been standard in 360/PS3 games for a few years now. When I look at launch PS4 games like KIllzone, I can already see plenty of processing and effects, not to mention geometry density which are a good way ahead of current gen. And that's a launch game. @MadAdam81 According to Digital Foundry, the Wii U version of Black Ops had far more slow down than any other version. Obviously early days and probably a quick port, but even a quick port should run well if the hardware is powerful enough. Other ports struggled too, such as the Sonic karting game, which ran at the same low res as the Xbox version. That's probably a lack of GPU fill-rate, which if the Wii U's GPU was really 'generations ahead' of the Xenos, wouldn't be an issue. The people who complain about the system's weakness just don't know much about coding n' junk, I guess. I mean, everyone complained about how the Wii was so weak, and Nintendo got graphics coming from that thing that were getting close to PS3/360 territory. It's all how you utilize the hardware. It's also worth remembering that many WiiU friendly developers have said simular things. However as is always the case the Negative comments from those developers less friendly get more headlines thus getting negitivity far more publicity than the positives. It's just too bad that this generation, only a few of the big 3rd parties will try to develop for Wii U architecture. We'll have to rely on Nintendo and the smaller 3rd parties that develop mostly for them to pull out the full potential of Wii U. It's my understanding that the Wii U's GPU is located on the same chip as the (triple core) processor, essentially turning it into a sort of makeshift quad core processor, only with one of those focusing entirely on graphics. That way there is no bottleneck that the GPU calculations have to go through, since it's already right there on the same chip. Perhaps that has something to do with what he meant about it being several generations ahead. I'm sure this has been pointed out already, but by 'generations', he obviously means GPU generations rather than console. In that case, he's probably spot on. The GPUs in the PS3 and 360 are DX9-based and were high-end in 2005. Now, they're pretty ancient. It seems to me that if a developer wants to know how to give their games the nicest graphics around (but not necessarily the most complex) despite working with an 'underpowered' console, they need only study the Super Mario Galaxies. It certainly seems to have worked for Shin'en recently (and by the looks of it the new Sonic too), and of course there's plenty else to learn about game design in there too. The part where he said several generations ahead, you seem to have pointed out yourself it's four generations ahead not seven. I don't know, I can't see getting super excited about a GPU being "several generations" ahead of something when you keep in mind that it's years newer. I mean, I'd hope it'd be better in some ways. Graphics aren't everything, though. It'll be interesting to see if Nintendo is able to capitalize on all of MS's missteps lately, for example. @moroboshi When you use the same data as the 360 version which is optimised for that console, you can't magically get better textures, resolutions or frames per second when they put it on the Wii U. When they can't be bothered optimising it, of course it won't run as smoothly. Similarly, Super Metroid doesn't run any better on Wii U, but they did make sure it was optimised for the console so it ran properly. @MadAdam81 In game development assets are nearly always authored to a higher resolution than will be seen on console hardware. This is done for use on the PC version, for promotional renders, and simply as insurance 'just in case'. Assuming the pipeline supports it, it's trivial to push higher end assets to new platforms, as would certainly of been the case with Black Ops 2. Therefore had the Wii U version been able to run with higher res textures (the system has more RAM than the 360 and PS3), then they should have been present. The fact that they weren't, implies that there are bandwidth issues on the GPU. In the case of the Sonic karting game, the console versions ran sub 720p, which is a common technique used when a game is fillrate limited. Simply put, by rendering fewer pixels, the GPU finishes quicker, and gets you closer to your target 33ms frame time. If the Wii U's GPU really was significantly more powerful than the Xenos or RSX, then it should have more fill rate, and so be able to render in 720p, if not 1080p. Changing the size of the frame buffer is not a big change for the code team, and would certainly have been done if the GPU had been able to handle it. Of course it's not quite that simple. There are always ways to optimise shaders, and it could be that some of the shaders which worked well on Xenos and RSX were simply performing poorly on the Wii U's GPU. We've obviously got no way to know that. However it's clearly not a good start that games designed for 8 year old vintage hardware run little better, and sometimes worse, on Nintendo's supposedly 'next-gen' hardware. The logical conclusion then, is that the Wii U is seriously underpowered, and stands no chance of running games which target PS4 and Xbox One. @moroboshi It was confirmed that the Wii U port of Black Ops II had the Xbox 360 engine only. When you know the confirmed facts, the logical conclusion is that Activision made the Wii U port as cheaply as possible due to the fact they didn't think that it would make enough money - which in itself is not that great. PS3 had the same problem, more powerful than 360 but the architecture was too complicated, meaning almost all PS3 versions were quick ports of the 360 version. A Wii U port of any game needs lots of console specific changes to make it run. The multi-platform game engine stuff you can port. That leaves the assets, which can be swapped in and out however you like. It's not a complete package. It's modular. @moroboshi And it was confirmed that each of these modules for the Wii U version of Black Ops 2 was taken from the 360 version, rather than the PC version, making the task quicker, easier and cheaper for developers. I am absolutely floored by how much argument there was over whether or not he meant console or GPU generations. Quote:The Wii U GPU is several generations ahead of the current gen.
For crying out loud, people. @PokeTune Plenty of third parties have experience with nintendo architecture, as they have all made poor crappy ports and cash grab games that fail to make sales on their system, just look a the 3ds, how many 3rd party games are selling well besides Monster hunter 3? not many outside the indie community, and i blame the devs for being lazy and not making a nintendo Unreal type engine to work with, of course, nintendo should also develop a top of the line engine by paying third parties to make one for them, that would help alot. All the articles of HDWarriors' interview with Shin'en, for those interested.